A little cottage-apartment hide-away where you can really feel at home. Harbour Cottage is the front half of a quirky, cosy, bigger Victorian cottage that would have been a fisherman's home. It's just 3 doors down from the harbour and beach. The cottage's position is fantastic too because it's parallel to the much-loved Harbour Street with all its bohemian shops and restaurants, but the street is somehow tucked quietly away. 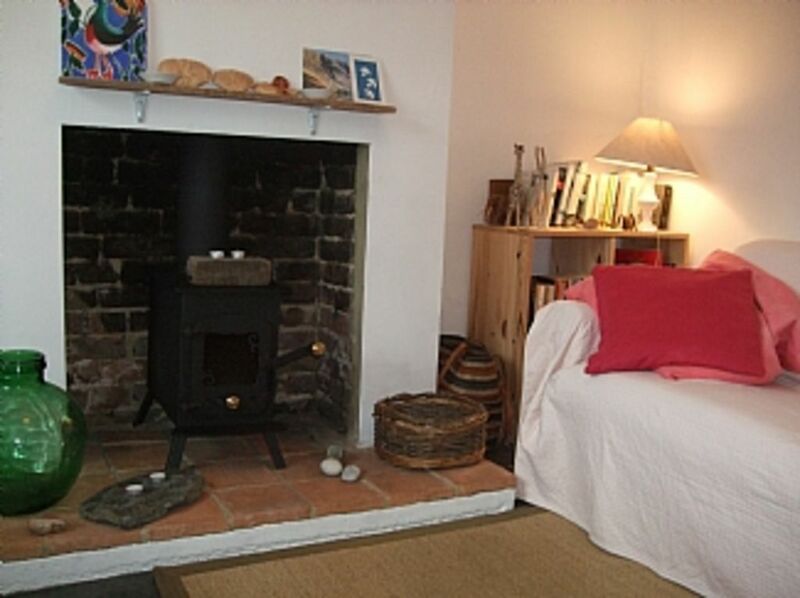 Harbour Cottage is small but perfectly formed! It has its own front door, tiled hall and old wooden staircase. There’s a light living room/kitchen with a woodburning stove. And upstairs a small private bathroom and sunny double bedroom. The cottage is ideally suited for a couple, but if you are two friends it works out well too as there's a comfy single mattress and low futon base you can either have pulled out in the bedroom, or downstairs in the living room. I have said that my cottage sleeps 3 because for a couple with a child aged 7+ the single bed means it's possible to all sleep upstairs in the bedroom. Alternatively for a couple who would like a friend to visit for a night or two during their stay (e.g. a grown up child studying at the university etc. ), they can have the single bed in the living room. But best is for two! But whoever does stay seems to love my little cottage, it's homely, rustic and comfortable, and everyone says it has a uniquely nice feel. If you don't already know the town, you will discover Whitstable is really special. It is a good mix of an old fashioned fishing small town community and artistic/foodie sophistication. The sea front has an unspoilt feel with hotchpotch white-washed cottages, old wooden fishing sheds and colourful beach huts. No concrete promenade here but a shingle beach with wooden groynes, wild flowers on the shore and oyster catchers pottering about. You can make your visit as lively or as quiet as you like: for a little town there's so much going on, but you can easily find complete peace too. There's sailing, wind or kite surfing, boat trips out to see seals and our wind farm, tearooms, fish restaurants, independent shops of all kinds, live bands, unique festivals. Wild seas, rural beaches, ancient woodland, fantastic light, sunny days, geese migrating. Perfect. And my little cottage is a lovely place to enjoy as your home in our wonderful little town. Finally my rents help me fund dog welfare and advocacy work in Spain - particularly for the podencos: a breed of hunting hound that are loving, sensitive, athletic comedians, and so stunning to look at. Tragically they are abandoned and so many killed in their thousands upon thousands every year in Spain when deemed redundant. So I try to balance providing a good value, lovely space for visitors, with keeping my income level so I am able to provide reliably for the dogs depending on me, and keep working with others to try and change this terrible situation. My thanks to all guests who rent my little cottage and thereby help these innocent souls who desperately need our support. Come to Harbour Cottage to find happiness for yourself and to help bring happiness to the dogs! I look forward to welcoming you to my little Harbour Cottage and hope you will have a happy stay here. I live next door, in the back half of the cottage (Garden Cottage) with a mix of family, friends and animal friends living or visiting here too. I've worked for many years in aid/international humanitarian work, with a focus on East Africa. Nowadays I am freelance and mostly work from home on environmental, animal welfare and art projects. In particular my rentals are helping fund a rescue and advocacy project for the podencos of Spain. Podencos are wonderful, gentle, athletic hunting dogs that are abused in their working lives and abandoned in their hundreds of thousands at the end of the short hunting season. I rent out the front half of the cottage as a separate apartment and aim to make it a welcoming place where visitors can really feel at home. I love to meet people from all over the world. I moved to Kent for a period of study. I meant to leave straight afterwards but I fell in love with Whitstable and stayed! I bought this cottage from a friend who was moving away and I have renovated it to divide it into two little homes: one for me and one to rent out. Everyone who comes to stay in Harbour Cottage says the cottage has a uniquely nice atmosphere and people comment that the cottage is more home than holiday rent. The position is great - right in the heart of the town and next to the beach, but a quiet street. Harbour Cottage is a comfortable place to stay in any season - in the summer you can cross the road to the beach, in the winter you can hunker down by the wood burning stove and get cosy after a windy walk or a meal out. Whitstable is great for townies (there's lots going on for such a small town) and for country-lovers (a couple of miles in each direction there are beautiful coastal nature reserves backed by fields) - and for sea-lovers of course. It's peaceful in the winter and lively in the summer, and a very warm community. It's great here! A private bathroom, very, very small but with all you need and it's light thanks to its old box sash window, white washed walls and wooden floorboards. It's not en-suite, but almost - next door to the bedroom on the landing. Sink, shower, WC. The living room includes the kitchen strip (see above). There's a handmade woodburning stove (logs provided), a comfortable sofa(bed), a table to sit and eat at, bookshelves with good reading, new TV/DVD, small radio/tape/CD player, wireless internet. Enough plates, pots and pans and cooking utensils to make your own meals and feel at home. The kitchen is a simple handmade reclaimed-wood strip along one wall of the living room. It has a new Bosch full-size electric oven & gas hob, extractor fan, ceramic butler's sink, a small fridge and cupboard space. A good size table to sit and eat at. Whitstable & Seasalter golf club, Par/SSS: 66/63, Yards:5058 Type: Links, Holes: 9. Tel: 01227272020 for details. Ten minute walk from cottage. Chestfield golf club, Par/SSS:70/0, Yards:6200, Type: Parkland. Holes:18. Tel: 01227793563 for details. Ten minute drive from cottage. Notes on accommodation: Harbour Cottage is the front half of a larger cottage. It's a self-contained apartment with its own entrance. The owner lives in the back half of the cottage (Garden Cottage) with an entrance through the garden. Dogs can be accommodated but please discuss directly with the owner. Generally accept up to one larger dog or two smaller ones. Smoking is not allowed in this property. Parking - Harbour Cottage does not have its own parking. However in quieter times it is easy to park in the street (free) just outside the cottage or very close by. In busier seasons there is the large Gorrell Tank town car park a two minute cut-through from the cottage. This is not expensive and there is always space. The cottage is ideal for a couple as there's just one bedroom (double bed), but if two friends want to stay it's easy - there is a pull out single mattress on low wooden futon base to have in the bedroom too or in the living room. Outside: Harbour Cottage does not have a garden or any outside space. This is at the back of the cottage in the half used by the owner (Garden Cottage)... BUT there is the beach a couple of minutes away!! You just cross the road and you have the whole length of the coastline available to you. Nearest is the harbour with its fishing boats, fish market, restaurant, craft stalls and live music at weekends. Then the shingle beach with groynes, the backs of old cottages and some restaurants facing the sea. On the other side of the harbour is a sandy (at low tide) beach and further along to the west is the south swale nature reserve beach or to the east Tankerton Slopes with its colourful beach huts and good kite surfing. Take a picnic or an evening glass of wine and olives across the road and sit with a huge sea view. If the owner is away visitors may be able use her small secluded pebbly garden and sunny patio on request. It can be accessed via a gate nearby Harbour Cottage's front door. Utility Room: Dustban & brush, hoover & cleaning materials under kitchen sink. Iron+ironing board stored in bedroom. Visitors staying for longer are welcome to request use of the owner's washing machine in the next door Garden Cottage. Cleaning / Towels / Linen / Maid service: Bedlinen will be supplied. Please bring own towels.. The cottage will be cleaned when you arrive. Vacuum cleaner and other cleaning materials available for your own tidy ups during your holiday. Other: Harbour Cottage is small but isn't cramped. Rather it is characterful and lovely! The living room & double bedroom are each 12 foot x 11 foot with high ceilings for an old cottage and big windows. Everyone says the cottage has lovely feel of its own and many visitors come back year after year as a real home from home. Really comfortable cottage. Excellent location within walking distance of everything including the railway station. Really impressed with Whitstable. Good to find a town that still has lots of independent shops. If you like food then this is a great place to be and inevitably the fish is wonderfully fresh and very well cooked. In addition I had the bonus of wonderful Indian summer weather in the middle of October. Thank you Whitstable and Harbour Cottage. We needed a short break to cheer me up after a back injury had caused me to miss lots of holidays, days out and events. We found Harbour Cottage, quizzed Polly as to its suitability and booked. We could not have done better. The location, minutes from the harbour, the shops, cafes and beach was simply perfect for me. All on the level, to accommodate my walking difficulties, too. The cottage is super, everything you could possibly want in an attractive, though small, space. We truly did not need any more room. We were there in very, very hot weather but the rooms stayed lovely and cool, although we did take a fan for the nights, as we were used to using one at home. Unfortunately, we didn't get to meet Polly, but we would certainly recommend her as a host and will be visiting again as soon as we can! A lovely quaint and cosy cottage, close to everything we needed so just perfect for our weekend attending a family wedding nearby. Polly was very accommodating and made us feel very welcome. We were lucky to park outside the house and then walked to town / beach / venue - all within minutes. Homeowner took care of our stay each step of the way. Excellent information packet. Excellent location. Wi-Fi much quicker than we are used to in Eastern Europe. Holiday in Whitstable, Kent...June 2018. Enjoyed our stay at the Fisherman's Cottage in Whitstable. Polly Matthewson made us feel very welcome and provided us with all amenities for a comfortable holiday. We left with happy memories. Whitstable is especially good for sea-food lovers (it is famous for its oysters and has several award-winning restaurants). Water sport fans (kite-surfing, wind-surfing, sailing, boat trips all possible). Artists, musicians and culture vultures (Whitstable is home to tens of artists, there is a vibrant arts centre, our local play house, lots of live bands, fantastic light to paint in). Also, Canterbury and London are respectively 20 minutes and one hour and a quarter away, so you can go to Canterbury's festival, to the cathedral and take a day-trip by train to everything London has to offer. Whitstable is full of sea birds, the South Swale reserve is a 10 minute drive away (migrating bird site), the ancient woodland of Blean woods is just down the road (you can walk to it from Whitstable down the Crab and Winkle Way foot and bike path) and all of Kent's inland countryside on your doorstep. Two minutes walk from pebbly characterful beaches. Softly sloping with groynes to break the waves - so ideal for children to paddle and for barbecues in private and out of the wind. One end of Whitstable the beach is famous for kite-surfing, the other end it is great for sailing. In between there are cheerful beach huts and access to good eating places and galleries. A 10 minute drive to a long sandy beach in a nature reserve. A coastal walk to Faversham along the shore is beautiful. Whitstable to London Victoria is a 1 hour 20 minute train journey. There's also the high-speed train between Whitstable and London St.Pancras. Luton, Heathrow, Gatwick airports are very accessible. Trains run from Whitstable to Herne Bay, Margate, Sandwich, Ramsgate etc. in the other direction. Canterbury is about 20 minutes drive or bus journey away. Whitstable is small -you don't need a car at all and public transport is great. Or bring your bike (or rent one locally £15 a day) - it's flat! Canterbury - Cathedral, museums, great eating and shopping, beautiful architecture. Canterbury Festival mid to end of October (with artists Open Houses in Canterbury, Faversham, Herne Bay and Whitstable). Faversham - historic market town with atmospheric creek-side wharfs with beautiful Thames Barges and interesting boats, wonderful walks across fields to peaceful pub. Hop Festival, folk club, local food, old-fashioned cinema, live music. Whitstable has won awards for its independent shops. There are local green grocers, a British cheese shop, independent wine shop, a local butchers, bakers along Harbour Street (not to mention restaurants, boutiques, gift shops and banks etc.). Just nip round the corner from Harbour Cottage and you are there. There's also a small Budgens and Co-operative supermarket within 10 minutes walk from the cottage. If you want a big supermarket there is a large Tesco and Sainsbury's a 15 minute drive away. Whitstable is known for so many things - art, water sports, beauty, sunsets, nature... it has that rare mix of being peaceful and homely with vibrant and quirky. Too much to write here - best to check out on Google etc. Booking Notes - please see below for points 1-3: Please contact the owner by email or phone for clarification on booking. (1) The full amount is payable on booking for all short visits that are less than a week duration, or for full weeks booked within two months of the visit. Otherwise 50% of the rent is payable on booking as a non-refundable deposit, and the remainder should be sent 2 months before check in. (2) Weekend only stays: Unfortunately there is no flexibility in the system to express that I charge more per night for weekend only stays. These are £90 per night for Friday and Saturday nights and £80 a night for a 3 night weekend Friday, Saturday, Sunday. I have had to give a basic average nightly rate as the system demands this. I hope that we can organise the correct rate by talking by email or phone. (3) Ideally bookings taken for full weeks and prices for different seasons are as given. For short stays there is a mimimum stay of 2 nights. Weekends and longer stays can be negotiated. A rough price guide for short stays is between £58 - £90 per night depending on the number of nights and time of year, and whether a short break will block a full week's rental in the high season. Changeover Day: I can often be flexible about changeover days, and about arrival and departure times. Notes on prices: Ideally bookings taken for full weeks and prices for different seasons are as given. For short stays there is a mimimum stay of 2 nights. Weekends and longer stays can be negotiated. A rough price guide for short stays is between £60 - £90 per night depending on the number of nights and time of year, and whether a short break will block a full week's rental in the high season.